First, sorry for the long absence. My website and blog have been temperamental lately, and going straight to the blog (musings) still doesn’t work. We’re still fiddling around, but hopefully it will only get better from here. More importantly, I am pleased to say that I was invited to take part in this year’s Craft-Tastic exhibit at Pelham Art Center in Pelham, NY! Check out all the info below, and if you’re in the area, or know someone who is, plan stop by. I’ve sent pieces from my Americana, Rooted, and Feisty Femmes series and I really hope that they all find new homes. A dynamic collection of quality handmade work will be on display and for sale, at the Pelham Art Center’s annual exhibition, Craft-Tastic, from Friday, November 13, 2015 to Saturday, January 2, 2016. Blown glass, woodwork, and dyed leather creations will be included among the many skilled craft disciplines. Craft-Tastic will feature 22 local and national artists who represent a range of traditional and modified craft techniques, creating all one-of-a-kind items. Supporting both local economy and artisans alike, the exhibition is a positive alternative to commercial holiday shopping. A hand-cut paper collage print, a wood and stone necklace or a naturally dyed silk scarf could be a unique and perfect gift for someone special. The opening reception will include a free all-ages hands-on craft workshop on Friday, November 13 from 6:30-8:00pm. Pelham Art Center members will receive a 15% discount on all Craft-Tastic gallery sales during a special Members’ Holiday Sale, December 1-5. Anyone can become a member of Pelham Art Center at any time. Craft-Tastic is curated by Kate Amato, the Gallery and Public Program Manager at Pelham Art Center and Gail Heidel. 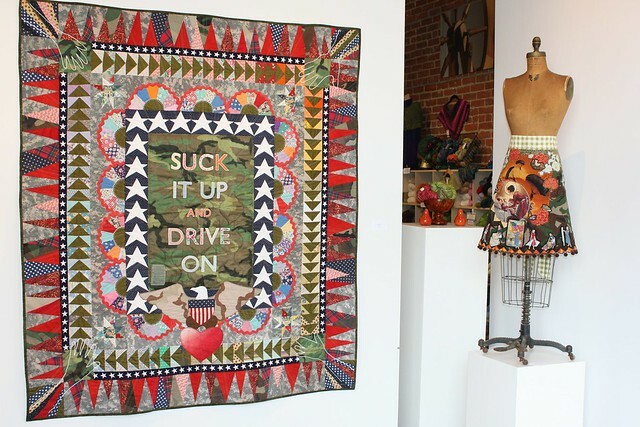 Last weekend I drove up to New York to hang my exhibit Home Fires at Etui Fiber Arts. We had a reception on Sunday which was unfortunately quiet — probably because of the impending storm and the Superbowl. The show looks fantastic though. The space is light and bright and shows off my work so well. The great news is that the show has been extended and will be on view at Etui until March 14th! 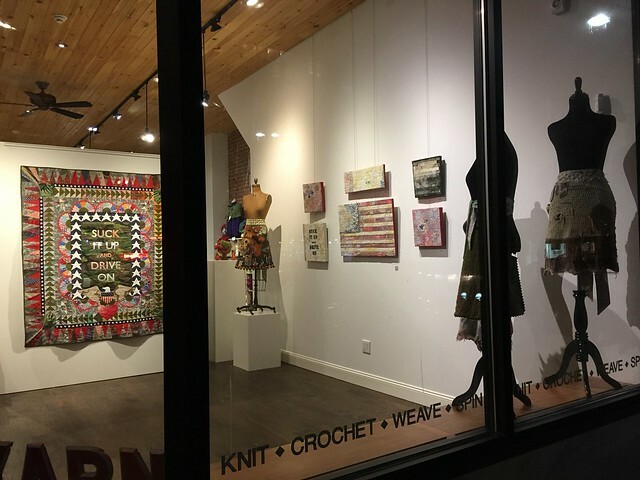 We will have an artist talk on the 14th as well as a workshop by my friend Natalya Aikens, and an opportunity to just hang out and work on stitched or knitted projects. So, if you missed the opening reception, please join us for a closing party in March! And, of course, one can see the show any time between now and then. I would be remiss if I didn’t also say that Natalya was instrumental in helping me hang this show. She’s awesome. Plus, I got to hang out with her all week-end which is great. We went to the Katonah Museum of Art to see their current exhibit Line Describing a Cone, which was quite fascinating. It’s great to go to an exhibit with a friend and be able to discuss what we’re experiencing. We both really liked a very organic piece made with zip ties, and I liked a sculpture defined by light, while she was entranced by an installation with mirrors. For most of the weekend (and bonus snow day) we talked and talked and talked, and, as happens every time we’re together, I came away with an inspired list of things to work on and new enthusiasm for my work. Artist play dates are great and I am so thankful that I have a group of wonderful artist girlfriends who all inspire me every day. I look forward to returning in March. It’s just about time! 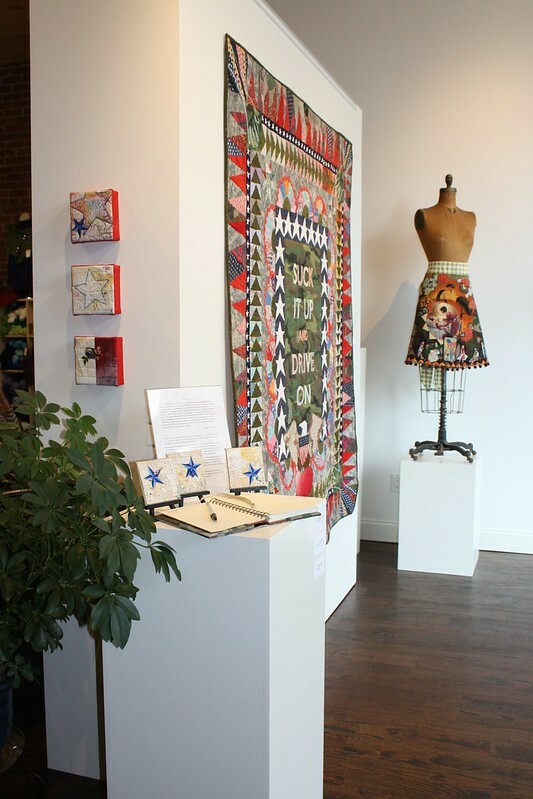 Wednesday Feb 4th is Virginia Spiegel’s Fiber Art for a Cause 100 fundraiser to fight cancer. The first 100 people to contact Virginia beginning at 10 a.m. Central on February 4th will be given a link to donate $100 directly to the American Cancer Society through Fiberart For A Cause. Each donor will receive an artwork from one of the 100 generous and talented artists participating. Assignments of artwork will be made using a random number generator. This is a great chance to collect a piece of art from one of 100 exciting fiber artists. Check out many of the donated artworks on Pinterest (click the link). My donation is Heart House shown below. Be one of the first 100 donors on Wednesday for a chance to add Heart House to your house. Questions? See all the details at VFFAC The 100. Special Note: Our goal of $10,000 will make Fiberart For A Cause’s donations to the American Cancer Society a nice even one-quarter of a million dollars. Some of my goals for the new year are to post to my blog more, update my website, and get better at promoting my work. I tackled an easy one first. I created a Facebook Fan Page and it’s going to be awesome. Why? Because I am somewhat ambivalent about my personal Facebook page. I know that FB is a good way to connect to people who might be interested in my art. It’s also a great way to keep in touch with far-flung family and friends. And then there’s the people from past lives or professional connections, who I want to stay connected to, but don’t necessarily want to know what they are doing on a daily basis, or want them to see all of my goofy antics. I’ve limited my Facebook “friends” to people I know personally or have established professional relationships with, and I try to keep my posts pretty art-related. It’s a tough balance and it means that not everyone who is interested in my artwork will be able to find me on FB to see what I’m up to. A fan page is open to everyone. I will post my art, some inspiration and in-progress work, and information about where to see my work. February is a big month for me, so be sure to “like” the page to get updates, and tell your friends too. I may even end up posting more on my Kristin La Flamme – Artist page than on my personal page. My personal page will probably narrow down to travel, family, knitting, goofing off with friends. I may even unfriend a bunch of professional contacts if I know they are happily following my artist fan page — where my professional info will be. That would come in time though. Next step should be to create a newsletter. That will be awesome for those who don’t do much Facebook. Last week I was invited to speak at the 11th Annual Healing Arts Exhibit at Walter Reed Military Medical Center. 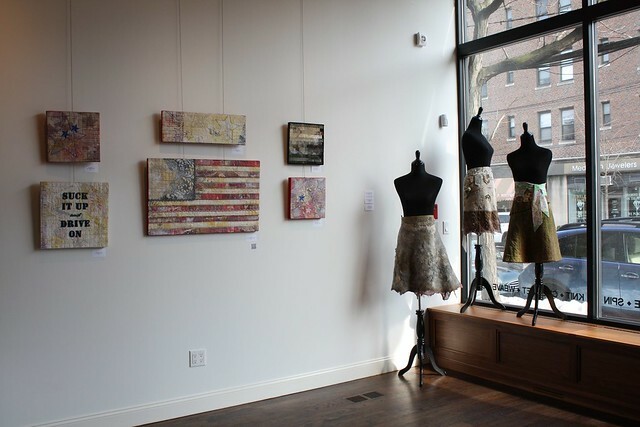 The exhibit started as an awareness campaign for the Breast Cancer Center and has now grown to encompass the use of the arts in many types of healing. The vast majority of artwork was created by patients at Walter Reed. Mine was there because the director loves my work and believes that it speaks to the same audience. I took four pieces from my Army Wife series. The two aprons on the plinth will stay for about a month — until mid November. It was a fantastic experience. I spoke about my inspiration for the series and how it not only allows me catharsis but can also give expression to others who may not have found their words or images. Apparently it went over well. It’s hard to predict what kinds of connections an event like this will create, but I met the young curator who put together the show, many well heeled ladies from the Spouses Club, and one in particular who already gave me some tips for local galleries to shop another show to. Best of all was sharing my artwork with an audience who “got it.” Several wives came up and thanked me for expressing their story. As an aside, there is nothing so humbling as spending a day at Walter Reed Military Medical Center. While my military experience has had it’s challenges, they are nothing compared to those faced by the service members themselves — especially those with visible and invisible injuries. I met several people whom I’m sure could tell fascinating stories. But the people watching is what amazes me every time I visit. Torsos outnumber limbs. I see different prostheses on every visit. Emerging from the elevator was a guy wearing standard leg prostheses and carrying blade prosthetics for running. Another man walking down the hall had a prosthetic hand with movable fingers. I think it was one of those that the wearer can control with their thoughts. There is always all manner of wheelchairs. Our favorite this time was the guy being pulled by his bulldog, but the dog was having a bit of a hard time because of the slippery floors. And then there’s the dogs. Many people have their own service dogs (like the wheelchair-pulling bully), but Walter Reed also has their own comfort dogs. Volunteers take these dogs around to patients or just hang around in the halls for anyone who needs a little doggy fix. Each dog has it’s own adorable harness/vest/pack thingie made from old military uniforms. They were made by a volunteer and are absolutely fantastic — some making great use of the uniform collars or pockets. One dog had her own custom ID tag. Too cute. My husband always stops to love on the dogs. It’s part of his own healing. I am honored to have been asked to be a (very small) part of this important center for our military service members and their families.